Hey everybody and welcome to the Coastal Georgia Kayak Fishing Blog. 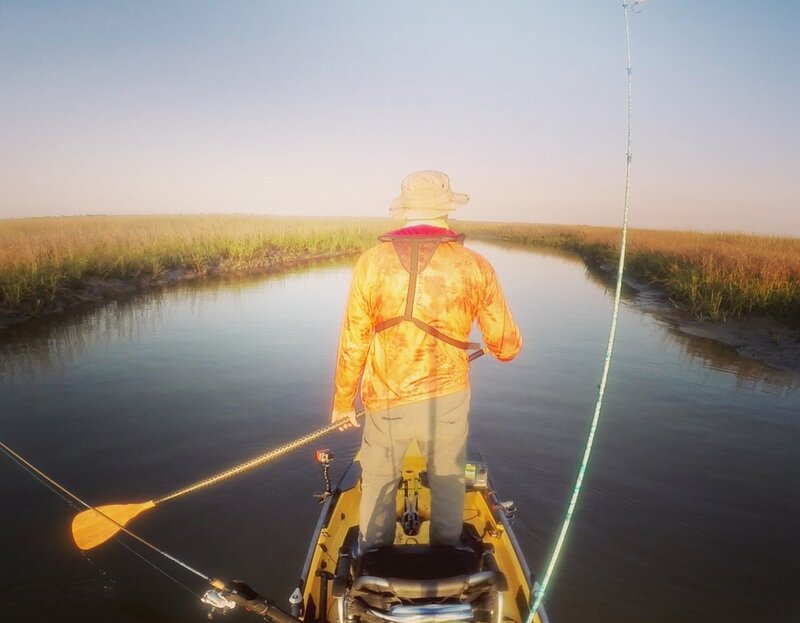 We’ll be posting articles every month about, well – kayak fishing on the Georgia coast. We’ll cover a wide range of topics in these articles: kayaks, rigging, and outfitting; gear selection and care; and the different species we target and the techniques we use, just to name a few. If you’ve got a topic you’d like to see us cover, let us know, and we’ll add it in. This month we’re starting with the most basic question of all – why fish out of a kayak? Surely there are more efficient or at least easier ways to fish than out of a small plastic craft that you power yourself, so why do it? Probably as many answers to that question as there are anglers to ask, but I can tell you why I choose kayak fishing. Bank fishing is fine, and it may be how many of us started, but it’s inherently limited. There are only so many places you can find to stand and fish, and it seems when you do find a cherry spot, those fish are always just out of reach. Hop in a kayak, and the water opens up to you. Now those fish are easily accessible, and you have choices about which side or angle to fish them from. With a kayak, you really don’t need much more room to launch and get over them than you did to stand and cast. That’s a major advantage kayaks have over powerboats (what some of us call stinkpots) – you don’t need a ramp to get in the water. Accessibility isn’t the kayak’s only advantage over larger craft. They are generally far less expensive to purchase, easier to store, and require none of the maintenance and motor repairs that plague boat owners. You don’t have to have a trailer to transport it; your motor never breaks down at the launch or on the water; and the only gas you need is a good breakfast before you go out. With all that said, those aren’t the most significant reasons I prefer kayak fishing to other styles; my motivations are of a different kind. I enjoy the challenge of being the motor, captain, guide, and angler when I’m on the water. If I’m going to get into fish, I’m gonna have to find them myself, under my own propulsion, and I’m going to have to manage wind, current, and boat position to make the cast and hook up. There are easier ways, but easier almost never means better when it comes to an accomplishment. Kayaks are by nature quiet and clean. I don’t have to put up with engine noise or the smell of a two cycle engine. When I’m on the water, I can hear the rhythmic crash of the surf, the call of gulls and ospreys, or the whoosh of a dolphin as it surfaces. I can fish in a relatively small area with a group of friends and be able to talk with them without having to shout. And I can do all this without leaving a slick of gasoline and oil on the water behind me. Finally, and maybe most importantly, when I find the spot I’ve been looking for, and I make that right cast and retrieve, there’s this moment of anticipation and expectation, right in front of me, virtually at eye level. I know there could be a fish there, and if I’m patient and thorough, the tug is gonna come. Sometimes it’s a thump, other times the lure just stops or gets heavy; I lift the rod, and when I feel the fish, I also feel the weight of the world lift off my shoulders and move to the end of my rod and line where I can do something with it. Kayak fishing restores my sense of serenity and makes me a human being. Whatever else is going on or might be waiting for me back at the launch, at that moment all is right in my world. Kevin Kelly is a kayak fishing guide with Savannah Canoe & Kayak, a member of the Hobie Fishing Team, and the founder of the Coastal Georgia Kayak Fishing Association. Check him out on Facebook, Instagram, and YouTube at Lowcountry Yaker Kayak Fishing - or schedule a kayak fishing trip with him at Savannah Canoe and Kayak!